Former Vice-President Atiku Abubakar has said that he did not attend the public presentation of President Muhammadu Buhari’s authorised biography, ‘Muhammadu Buhari: The Challenges of Leadership in Nigeria’ on Monday because he got the invitation to the event late. The explanation was contained in a statement by Abubakar’s Media Adviser, Paul Ibe. Ibe claimed that the former Vice-President only received the invitation on Monday after the event had started. He, however, admitted that the invitation dated September 30 was received in Abubakar’s office on Saturday. He said, “For inexplicable reason, the former Vice President only received his invitation today (Monday) after the event had started. 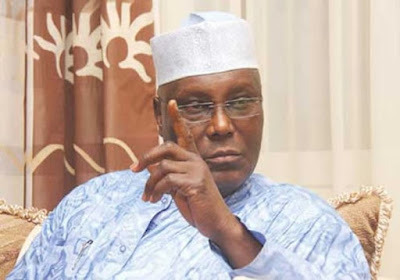 “It is on record that the invitation for the Turakin Adamawa was delivered to the Atiku Centre on October 1, 40 hours before the event of today, and only after the former Vice President had travelled to Gombe to honour the invitation for the celebrations of the 20th anniversary of the creation of creation of the State. “The former Vice-President returned to Abuja on Sunday night, October 2. “The invitation letter signed September 30, 2016, the last working day of the week was handed over to Atiku Abubakar today (Monday), after the programme had commenced. Abubakar was one of those who contested for the presidential ticket of the All Progressives Congress against Buhari in Lagos in 2015. The former Vice-President came third behind Buhari and a former Kano State Governor, Senator Rabiu Kwankwaso.